You might be anyone, carrying nothing. Before activating a device, a doctor cryptically tells you that depending on what you do, your future will be either dangerous and exciting or very short. Then, with no other explanations or instructions, you find yourself in a well-to-do corridor featuring four doors, a couch, and a picture. The author has classified the genre as a "Mystery", but that seems incorrect. You're trying to solve a puzzle, not a crime. Flawed Addendum (Jalbum; 11-Jun-2008; Z-code). Download Addendum.zblorb from the IF Archive - The story file. 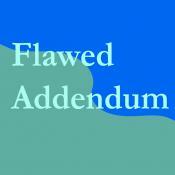 Flawed Addendum - at IFDB.